Scott Halasz | Greene County News Greene County Parks and Trails officially opened its new disc golf course at Karohl Park in Beavercreek. Cutting the ribbon are County Administrator Brandon Huddleson, County Commissioner Tom Koogler, Parks Commissioner Michelle Jenkins, Brian Crabtree from Hazy Shade Disc Golf, and Cedarville University professor of environmental science Dr. Mark Gathany. Cedarville University professor of environmental science Dr. Mark Gathany fires off the first official drive at Karohl Park in Beavercreek, home of the county’s newest disc golf course. Brian Crabtree from Hazy Shade Disc Golf takes the second official toss the county’s newest disc golf course. BEAVERCREEK — Greene County Parks & Trails officially opened its first disc golf course with a ribbon-cutting ceremony at Karohl Park in Beavercreek May 24. The 18-hole disc golf course includes a practice tee and offers challenging play on the rolling fields of the park. 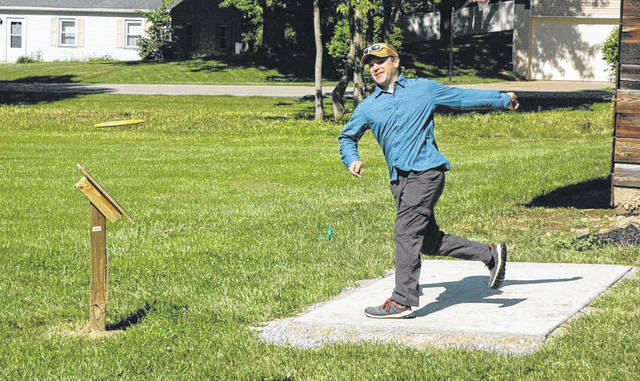 Greene County Parks & Trails Director Jon Dobney said the new disc golf course illustrates the park agency’s commitment to providing family-friendly activities throughout Greene County. Cedarville University professor and avid disc golf player Mark Gathany designed the disc golf course. Community residents Scott Silvis and Briana Crabtree also participated in the development of the course. Donors to the course include Kettering Health Network, Lowes Home Improvement — Xenia, In Memory of SSG Wesley Williams, GE Avaiation-Dayton Elano, Andrew Harmon — Allstate, King’s Table Bar & Grill and Howar Painting. The disc golf course — located at 2940 Hohl Drive — will be open sunrise to sunset with tournament play scheduled throughout the year. In the future, disc golf camps for youth and adults will be offered. https://www.fairborndailyherald.com/wp-content/uploads/sites/50/2018/05/web1_DSC_6059.jpgScott Halasz | Greene County News Greene County Parks and Trails officially opened its new disc golf course at Karohl Park in Beavercreek. 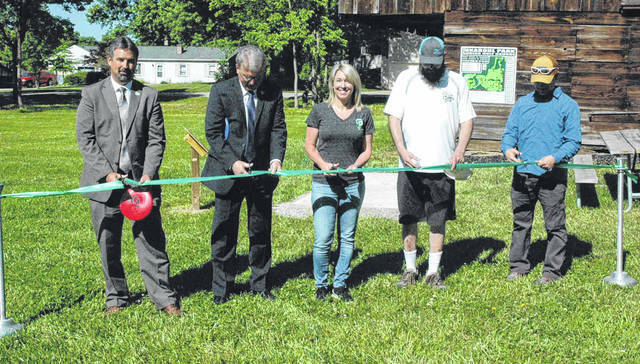 Cutting the ribbon are County Administrator Brandon Huddleson, County Commissioner Tom Koogler, Parks Commissioner Michelle Jenkins, Brian Crabtree from Hazy Shade Disc Golf, and Cedarville University professor of environmental science Dr. Mark Gathany. https://www.fairborndailyherald.com/wp-content/uploads/sites/50/2018/05/web1_DSC_6060.jpgCedarville University professor of environmental science Dr. Mark Gathany fires off the first official drive at Karohl Park in Beavercreek, home of the county’s newest disc golf course. 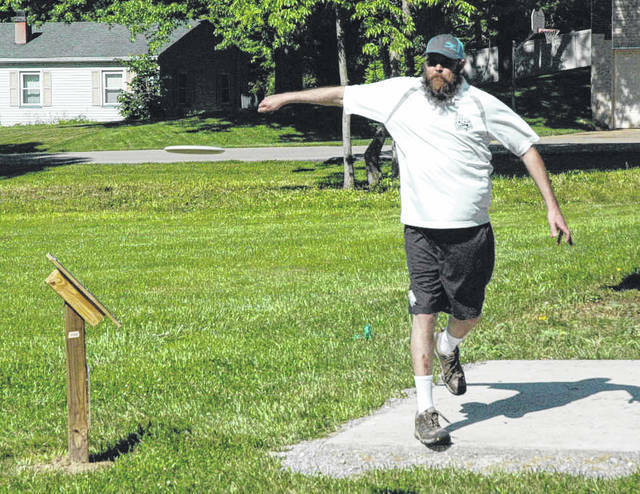 https://www.fairborndailyherald.com/wp-content/uploads/sites/50/2018/05/web1_DSC_6061.jpgBrian Crabtree from Hazy Shade Disc Golf takes the second official toss the county’s newest disc golf course.